Someone has recently made changes to this site and the site is being updates. If the site remains offline for an extended period if time, contact a site owner. Wait a moment and refresh your browser. 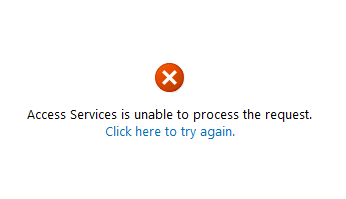 "Access Service is unable to process the request. 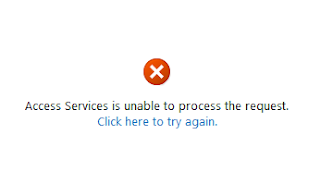 click here to try again"
In my scenario I used the manual way to provision the Access Services using a dedicated application pool. I have tried different account and even used farm service account to no avail. Finally, I got it to work by using the configuration wizard. Not sure why by running the configuration wizard resolved the issue, but I will need to investigate the issue further once I have the time.